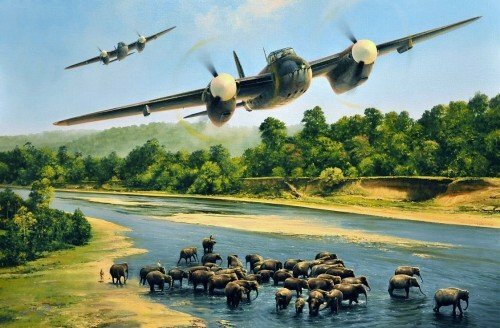 Led by Wing Commander J.B. Nicolson VC, CO of 27 Squadron (the Flying Elephants) based in north-east India, a pair of Mosquito FBVIs power their way home across jungle-covered hills of northern Burma. They have just completed the squadron’s first combat operation, a successful strike against Japanese ground targets along the vital railway link near Mandalay, Christmas Day 1943. Fought in often atrocious conditions, the war against the Japanese in Burma was cruel, savage and brutal. Flushed with thoughts of invincibility after their quick victories in Malaya and Singapore, by 1943 the Imperial Japanese Army had pushed the Allies all the way back to the borders of India, the jewel in the crown of the British Empire. Every print in Richard’s new edition has been personally signed by RAF aircrew who flew the Mosquito during WWII, creating a fitting tribute to this magnificent aircraft and making it an important addition to any aviation art collection. THE LIMITED EDITION : Each print has been personally signed by three RAF veterans who flew the de Havilland Mosquito during World War II. They are also signed by the artist, Richard Taylor, and individually hand-numbered.